…on the seventh day of Christmas my green friend gave to me…seven chocolate bars..six pounds of spinach…five milkweed plants…four smart bulbs…three Amazon Echos…two Ecobees…and a live Christmas tree! On this seventh day of a green Christmas and also New Year’s Eve my green friend knows how I love fair trade, organic dark chocolate, especially with a champagne toast for the New Year! Dark chocolate with other ingredients are a treat so the seven bars of chocolate are my favorites,; with raspberries, with sea salt, with red pepper, with almonds, with mint, with blueberries and with coconut! I may have to try one small piece of each with champagne this evening and will have lots left over to enjoy until they are gone. So good and so good for you, organic dark chocolate has many health benefits and depending on the brand you buy may even benefit the growers! The bars I received today were the Endangered Species brand organic dark chocolate with 88% cocoa! 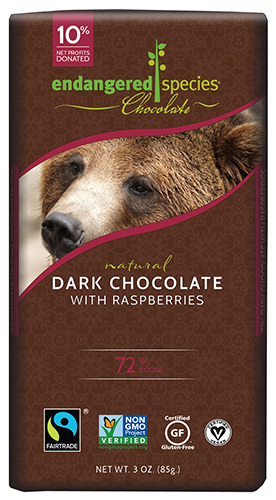 I like the idea of buying/giving/receiving Endangered Species products because they have only fair trade, organic chocolate and they donate 10% of their net proceeds to their “GiveBack” partners who are mainly wildlife organizations. Be sure to check out other fair-trade chocolatiers here! Unfortunately as the demand for quality chocolate increased, the methods of cacao farming saw child labor and unfair trade practices escalate. The establishment of FairTrade America and Fair Trade Federation, both non-profit organizations, has helped reduce the amount of child labor through its’ certification process. Many of the Fair-Trade certified farmers also use sustainable farming practices which provide us with a healthier alternative when selecting chocolates and have increased the biodiversity of their farms by growing cacao without synthetic pesticides and fertilizers. FairTrade America is not just about chocolate so be sure to explore other FairTrade certified products to know you are doing what you can to eliminate unfair labor standards. My green friend seems to spoil me every year with organic dark chocolate, knowing how I love it! 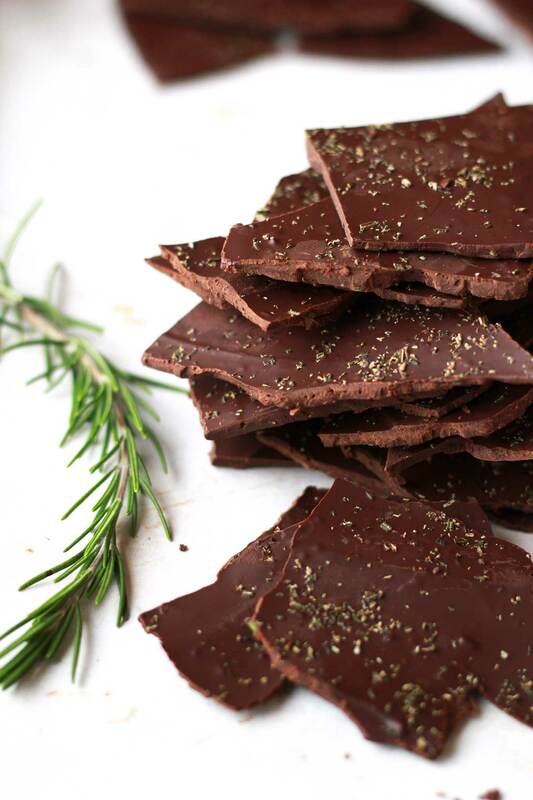 Beth’s recipe for Rosemary Chocolate bark is a great way to make your own deliciously flavored chocolate bark which is also becoming a tradition of mine to make as gifts. Do you have any great, healthy chocolate recipes you can share? If so, please share your recipe in the comments. If this is the first post you have read of my Twelve Days of a Green Christmas and you can’t figure out what the heck I am writing about or why I’m writing about the Twelve Days after Christmas click here to read how this all began. Thank you for reading my rendition of the Seventh Day of Christmas and I hope you join me tomorrow for the Eighth Day of a Green Christmas! HAPPY NEW YEAR! !